Feb. 28, 2018 | Feb. 28, 2018 | UAMS Medical Center is the only hospital in central Arkansas to have received international recognition as “baby friendly” for its policies and procedures encouraging new mothers to breastfeed as a healthier way to feed their babies. The University of Arkansas for Medical Sciences (UAMS) delivers more than 3,000 babies a year. To achieve the baby-friendly designation, UAMS completed rigorous requirements in each of four phases and passed an on-site assessment. A baby-friendly display at UAMS. The effort was initiated by Ginny Smith, R.N., M.S.N., women and infants nursing director, and neonatologist Misty Virmani, M.D., and led by Becky Sartini, D.N.P., assistant director of nursing for the neonatal intensive care unit. Breastmilk contains antibodies that help babies fight off viruses and bacteria, reduces the risk of developing allergies and respiratory illnesses and lowers the risk of obesity. For the mother, breastfeeding lowers the risk of breast and ovarian cancer and osteoporosis. UAMS Medical Center joins five other hospitals across the state in obtaining the baby friendly designation, awarded by Baby-Friendly USA Inc., the accrediting body for the hospital initiative. The baby-friendly designation requires verification of policies, curriculum, action plans, quality improvement projects, staff training, competency verification, a readiness interview and an on-site survey. Breastfeeding is one of nine priority areas of Healthy Active Arkansas, a 10-year plan announced in 2015 by Gov. Asa Hutchinson to provide community-based efforts to reduce obesity. UAMS co-chairs the plan’s breastfeeding committee with Baptist Health. Hospitals provide a unique and critical link between the breastfeeding support provided before and after delivery. 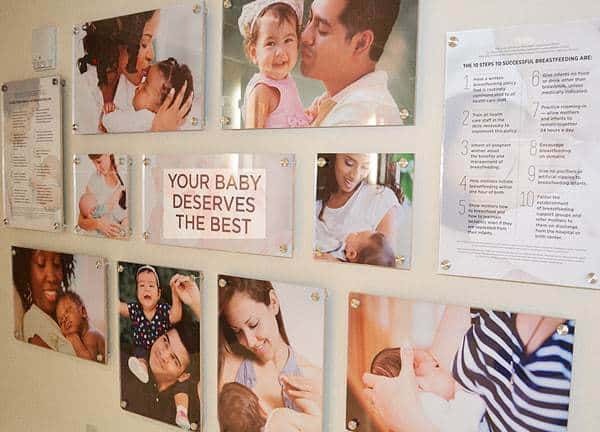 Mothers who give birth at baby-friendly hospitals and birthing centers are more likely to initiate exclusive breastfeeding and more likely to sustain breastfeeding at six months and one year of age. Give infants no food or drink other than breast milk unless medically indicated. Adhering to the Ten Steps is associated with increased rates of breastfeeding around the world. Also, adhering to the Ten Steps decreases racial, ethnic and socio-cultural disparities in breastfeeding rates in U.S. hospitals.